Ananda. Transcendental bliss. The Vedanta-sutra says that the Supreme is by nature all-blissful. Therefore when one links oneself with the Supreme through devotional service one becomes naturally blissful also. According to the Vedic analysis, there are three kinds of happiness: material, spiritual, and devotional. The senses of our material bodies bring us feelings of happiness from what we hear, see, touch, taste, or smell, but these sensations are unsatisfying because they are limited and temporary, and they ultimately make us miserable by entangling us in the complexities of the material world and the cycle of birth and death. Ordinary mental and intellectual happiness are but subtle forms of the same material entanglement. When we realize that our material bodies are not our real selves and we awaken to our eternal nature as spiritual souls, we naturally become spiritually happy. But when we realize our eternal loving relationship with the Supreme Absolute—with Krsna, the Supreme Personality of Godhead—we taste a happiness that makes even the happiness of self-realization seem insignificant. Even self-realized souls who are immersed in the happiness of self-realization and have lost all taste for material enjoyment become attracted to the transcendental taste of rendering devotional service to Krsna. Arca-vigraha. 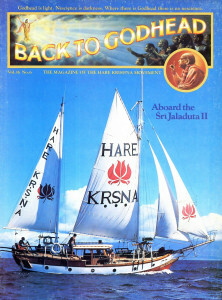 In temples of Krsna consciousness, the Supreme Lord is the center of attention in the form called arca-vigraha. The arca-vigraha is apparently a painting or statue fashioned of material elements, but an enlightened devotee sees no difference between the arca-vigraha in the temple and the Lord’s eternal form in the spiritual world. The worship of the arca-vigraha is quite distinct from idolatry; far from being an icon carved from the worshiper’s imagination, the arca-vigraha corresponds precisely to the eternal form of the Personality of Godhead described in the Vedic scriptures, which originate from the Lord Himself. Although Western traditions generally offer either a vague, invisible God or a God made visible only through artistic speculations, the Vedic literature describes in detail and with authority what God looks like. And the Vedic scriptures tell us that because God’s form is absolute, God’s form and God Himself are non-different. So when the form of the Lord is present, the Lord Himself is present also. Of course, the Lord is present everywhere, even in the material world, in every atom and between all the atoms of creation, but the arca-vigraha—the Lord’s form in the temple—enables us to realize the Lord’s presence by seeing His transcendental form even in the material world. Aryan. The word aryan refers to a civilization based on spiritual knowledge and culture. The members of such a civilization are called aryans. Apart from this original meaning, the term aryan has suffered a long history of misuse. Various groups in India have taken pride in calling themselves aryans, using the word to assert national or racial superiority. With the rise of the Third Reich, the Nazis appropriated the title and claimed national and racial superiority for themselves. To use the word aryan in such a way is to give evidence that in fact one is not an aryan at all. One identifies himself with his material body—and thereby with a particular race and nation—only when one has forgotten who he really is. Despite material power or aristocracy, such a person, far from being an aryan, is a spiritual cripple. Asana. Literally meaning “seat,” the word asana may refer either to one’s sitting place or to the posture in which one sits. In the ancient eightfold yoga system, one had to observe complete celibacy and strictly control one’s mind and senses. Having left one’s home and retired to a sacred and solitary place, one would sit in the classic yoga posture, regulate one’s breath, and meditate until one attained realization of the Supreme in a perfect state of trance. In this way one would achieve liberation from the cycle of birth and death. But although this is an authentic yoga system and is described in Bhagavad-gita, it is unsuitable for the present age because it requires one to undergo disciplines that are now almost impossible. As a mechanical part has no value without the rest of the machine to which it belongs, the sitting postures by themselves are virtually useless for spiritual realization. The postures may be good for physical health—but, then, so are jumping jacks. One cannot attain self-realization merely by Indian gymnastics. Asrama. 1. A place of spiritual culture. The residence or monastery where a guru instructs and enlightens his disciples. 2. One of the four “spiritual orders” of the Vedic way of life. According to the Vedic plan, one progresses through four asramas, or stages for spiritual development—student life (brahmacarya), married life (grhastha), retired life (vanaprastha), and renounced life (sannyasa). In student life (brahmacarya-asrama), one observes a vow of celibacy and receives training in self-realization from a spiritual master. When the student becomes a young man, he may marry and continue his spiritual life as a responsible householder. He is then said to be in the grhastha-asrama. (One whose householder life centers on sexual enjoyment rather than spiritual enlightenment is considered to have left the grhastha-asrama for life as a grha-medhi, a materialist.) When the householder reaches the age of fifty, he should detach himself from the complex entanglements of householder life by resuming a life of celibacy and handing over his family responsibilities to his heirs. In this retired stage of life (the vanaprastha-asrama), a man and his wife may travel to holy places of pilgrimage and focus their lives more intently on attaining self-realization. Finally, the wife should return home to the care of her family to mature to full spiritual realization, and the husband should accept a life of full renunciation (the sannyasa-asrama) in which he dedicates himself to achieving perfect realization and imparting spiritual understanding to the members of the other three asramas. By defining one’s duties throughout life in terms of these four asramas, the Vedic culture sets forth a plan by which every stage of one’s life has meaning and value for the attainment of spiritual enlightenment and for the welfare of the whole society.